Mount Menthosa is the second highest Peak (6443m) in the Lahoul-Spiti Province of Himachal Pradesh. The first team to climb Mount Menthosa was British Service Team lead by Capt. S. Bembrose in 1970. R.E.M.E Capt. R. Cape and Royal Marine Lt. S. Rae were the only two members of that team to climb the summit. Route Details: Nearest airport from the Mount Menthosa is Kullu. Flights are available every day from Delhi to Kullu airport. Manali, a beautiful hill station, is only 55kms away from the Kullu Airport. Manali is easily accessible from Delhi through road and rail as well. 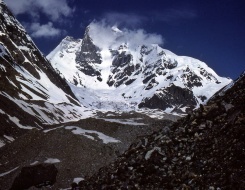 The valley of Lahoul can be reached from Manali after crossing Rohtang La. From Udaipur, a sub-division in the valley of Lahaol, take the porters for Mahindra and Menthosa summits. Few of these porters are well experienced with routes and the journey system. Trekking starts from Urgos which can be easily reached by vehicle. The trek is of 12kms. Best time to visit: & Best time to climb Mount Menthosa is May-Sep.
Take AC Volvo Coach from Delhi to Manali by 18:00 hrs. Overnight journey. Arrive Manali by morning at 08:30 hrs. On arrival meet our executive and transfer to hotel. The day is for rest and get acclimatise. Overnight in hotel. In the morning after breakfast drive to Udaipur. It is a full days drive from Manali to Udaipur in Lahaul Valley. Udaipur is only at 2650m so there is no drama regarding acclimatization for new arrivals. Overnight stay in Guest House. This portion of the Miyar valley has a road to within 1 or 2 kms from Urgos. So we can take a taxi to there, or to Urgos if the road has been finished. From Udaipur the trail follows the Miyar Nullah (river) to Chamrat (2950m), the first of the Buddhist Villages in the Miyar Valley. The walking time is about 4 – 5 hours. Urgos (3250m) is the main village in the valley and it is from here that the approach to the mountain proper is made. Will need to hire porters to help us for the one-day walk to base camp. The Friendship Peak Climbing is very interesting. From base camp to camp 1 you must travel across a glacier that provides complete exposure to a Himalayan Glacier. Lots of crevasses and excitement. This takes you to camp one at Urgos pass. From Camp 1 to Camp 2 we must fix the rope over an icefall to camp 2. Camp 2 is the final camp before the summit. Walk out from base camp and return to Manali. Arrival at Delhi by 06:30 hrs and transfer to hotel. By evening transfer to airport.. Trip & Services Ends Here. • At Hotel only breakfast will serve, while on mountain all meal will be provided. The meal will be mix of Indian, chinese & Continental. Freshly cooked by our cook. • Peak Climbing fees, IMF fees, LO Fees etc..